You are browsing the archive for Open Journalism. Journalism++ — is a network of companies and individuals who share common passion for data-driven story telling. According to the manifesto, they define journalism as “making interesting what is important” and not the opposite. “We believe that open beats closed. Open source is our default behaviour”, — said in the manifesto. Now J++ consists of six independent agencies in Porto, Paris, Amsterdam, Cologne, Berlin and Stockholm. Journalism++ Stockholm was created in January 2013 by Jens Finnäs and Peter Grensund, two of the best data-driven journalists in Sweden. They produce several interactive apps and data-heavy investigation for the top newspapers in Scandinavia. OKFN Sweden talked to Jens Finnäs about the J++ project and the development of data journalism in Sweden. - Hi Jens. How did it all begin? How did you start with data journalism? I started around 2011 when I was living in Finland. I have a traditional journalistic background. I studied journalism and political science (graduated from University of Helsinki). Then I started to learn about the concept of data journalism in the American and UK context. Through different tutorials such as webscraping by ProBublica, I opened up programming and coding for myself. When I was younger, I made some websites and had the idea that I’d like to learn coding. And I really enjoyed it. So, it wasn’t like “ok, now I start to do something for data journalism”. No, at first, it was just fun to do scraping and data analysis. Then I progressed and started using data-driven methods while working as a freelancer. I did more and more data-driven stories and eventually I started to sell visualizations. - That means you are completely self-educated in this field? Yes, all the things I’ve learnt about programming I’ve learnt on my own. - How did J++ Stockholm begin? Three years ago, I moved to Stockholm, started working as a freelancer and got a job at Sveriges Radio after a year. So, I was working for one year in different newsrooms there. And one and a half years ago I founded Journalism++ Stockholm project together with Peter Grensund. 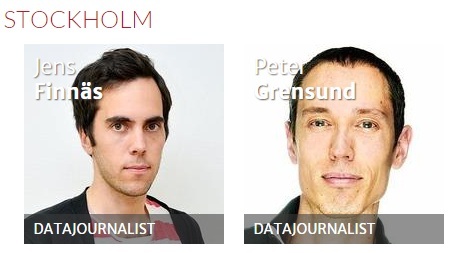 We are the first journalists in Sweden specialized in data journalism. - How did you decide to join J++ project? It was a lucky coincidence. I met Nicolas Kayser-Bril (one of the founders of Journalism++ project) through conferences, mentioning that I could start something in Sweden. At the time they had already founded J++ Paris and Berlin projects and were thinking about the expanding the network. J++ Stockholm became the next project joining the network. So, that was a coincidence. - Who is in your team here in Stockholm? It’s only me and Peter who work full time but then we have other specialists involved for different projects. We work together with statisticians and developers. Currently, we also have one intern – a journalistic student. - What are your most successful projects so far? Our projects about the Swedish Parliamentary elections 2014 are pretty exciting. Valkompassen – a voting advice application for the Swedish tabloid Aftonbladet is one of them. The second project I would mention is “Kan du lova” – a local initiative organized together with MittMedia. - You gathered a lot of information about different tools and programmes in data analysis in your blog. But in your everyday work what are the most frequently used tools? Now I am more and more towards programming. So, I’m trying to move away even from using Excel. That means that Python (a programming language) becomes more important. Recently I also started to use R – statistical programme language. What I like about programming is that it allows you to trace your mistakes and be more flexible in case the data you analyzed has changed. Personally, I try to do more and more with code. - What are your recommendations for beginners in data journalism? How to start? First, you should learn about the field, you should have an idea what you can do, what’s difficult for you and what’s not. I don’t think that programming is for everyone. I think one should try it out and see if it’s fun. You should see the potential in it and see how useful it can become for you. - Do you think that courses in coding and programming should be included in journalistic education? They could be included in journalistic educational programmes at least not as mandatory courser. I visited Columbia University in the City of New York and they did Python classes for their journalistic students. And that’s probably an idea where we are heading. Certainly, journalists should learn about data-thinking and basic Excel skills. Knowledge about regressions and correlations together with courses in SPSS can be very useful not only in research but in journalistic work. It is important to have different perspectives on these tools and skills that can be applied not only in academic research. - How do you see the development of data journalism in Sweden? It’s been a huge change since I started it. When I started, it wasn’t even a concept and now for example Södertörns Högskola already includes this concept in their courses. The first data journalism conference in Nordic countries was arranged last year in Stockholm. So, certainly the interest has risen. However, I think there are only few newsrooms that have actually been able to incorporate programmers in their news making processes. Still, traditional journalism prevails. I see, for example, that several Norwegian papers have made it further than Swedish ones. - Is there a high demand for data journalism in Sweden? I’ve been working as a traditional freelancer before and it was much more demanding to be on that market and sell “normal” stories or interviews. It’s easier to value your work this way. But for sure, data journalism skills will raise your chances to be employed. Skills in data journalism are certainly your advantage. There is not really a big competition in this field in Sweden. I think the more journalists practice data journalism, the more this field will be established and become better. - Did you think about making some special courses for journalists in Sweden? We have thought about doing some courses. I have an idea about doing some programming basics for journalists. But on the other hand we’re teaching quite a lot, giving workshops and trainings for the media. And I don’t want to spend all my time teaching journalists. It’s more fun to do stuff on your own. - Is it easier for a journalist to learn programming or for a developer to become a journalist? Well, difficult to say. If I were in charge of a newsroom, I would experiment with trying to hire people with different skills. Interesting things usually happen when people with different skills work together. I think this is the next step for the newsrooms. Många journalister är inte intresserade i programmering, eftersom de oftast har humanistisk bakgrund. Dessutom har journalister ofta inte möjlighet att arbeta direkt med utvecklare och designer. Datajournalisten Natalia Karbasova som jobbar i Hubert Burda Media (Tyskland) förklarar, varför hackathon är bra för journalisters utveckling. För att motivera journalister delta i hackathon - har vi därför en kort sammanfattning av hennes artikel. Om du som journalist har viljan att lära sig att arbeta i ett team med programmerare och skapa digitala produkter från grunden, det är ett billigt och snabbt sätt att göra det – delta i hackathon. Vad är ett Hackathon? Hackathon (på engelska en sammansättning av «hacker» + «marathon») är ett evenemang som pågår som regel under två dagar där olika team av programmerare, designers, ibland journalister och människor med andra bakgrunder & kompetenser skapar nya produkter och lösningar. Hackathon kan utgå från en specifik API (Application Programming Interface) och sponsras ofta av ett privat företag för att få fram nya idéer till potentiella produkter eller nya användningsfall. Några Hackathon kan ägnas åt ett specifikt ämne. Ett exempel är HälsoHackathonet (8-9 november, Stockholm) som är finaldelen av app-tävlingen APPlicera Hälsa. Målsättningen är att hitta en applikation som på något sätt möjliggör för patienten att vara mer delaktig och med enkla medel ta ett större ansvar för sin egen vård. HälsoHackathonet anordnas av Forum för Välfärd (FfV) med stöd av Investor AB och McKinsey & Co samt Open Knowledge Foundation Sverige (OKFN). Läs mer här. För att hitta hackathon som utvecklats med journalister i åtanke, besök gärna Knight-Mozilla Stiftelsens OpenNews-webbplats. Nu är det dags att förklara varför det är viktigt att delta i hackathon som reporter och journalist, även om en inte kan programmera. 1. Du kommer ut ur din komfortzon och prova nya roller. Tror du att ingen behöver journalister på hackathon? Tänk igen. Kodare behöver människor som kan förklara och kommunicera galna saker de har precis gjort – berättare (storytellers)! Eftersom journalister gör det professionellt varje dag – pratar med experter, läser specialiserade publikationer för att få mer insikt i ett visst ämne och slutligen presenterar det till sina målgrupper på ett enkelt och tydligt sätt, är de vara mycket användbara vid hackathon. I detta Medium-inlägg “Hackathon-ing as a Non-Developer”, kan du lära dig mer om hur en icke-kodare kan vara användbara vid ett hackathon. 2. Du lär dig om kod – gratis och bara under två dagar. Även om du inte bör förvänta att du skulle bli en stjärna kodare efter att ha gått ett hackathon, kommer du definitivt plocka upp ett par saker som kan motivera dig att lära dig mer. 3. Du skapar ett verktyg och lösning som skulle kunna användas i dina eller andras egna medier. 4. Du lär dig att tänka som en av grundarna och arbeta under extrem tidspress. Att förstå i grunden vad det innebär att lära sig hur nystartade organisationer arbetar kommer definitivt att vara en stor fördel för din kompetensutveckling. Entreprenörskultur är något medieorganisationer bör lära sig för att fortsätta spela en roll i medialandskapet, och en av dem som redan erkänt det är New York Times vilket läcktes i deras Innovation Report. 5. Du får erfarenhet att köra din egen hackathon Om du vill veta mer kan du läsa här handledningen på öppna data hackathon. Här finns också några användbara tips om hur man organiserar ett hackathon. 6. Bonus: Du förstår slutligen att kodare och designer är trevliga personer! 7. Bonus: Under Hackathon lär du känna nya människor och bygger nätverk som kan innebära intressanta samarbeten i framtiden! Den originala artikeln på ryska finns här – OKFN Ryssland.